Some links #8: Are you WEIRD? The syphilis, combined with the constant irritation of the corset, had apparently caused a build up of desposits, which eventually ossified and turned in to bone. REAL BONE, with marrow and holes in it and everything! 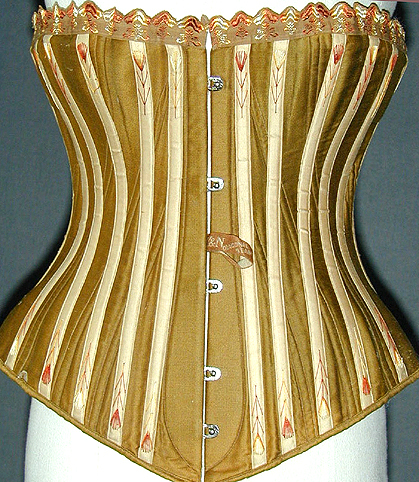 […] So the moral of this story is: if you’re a guy, and you’re vain about your appearance, get a flat front corset. You don’t want to be sitting down in something pointy. Researchers first recorded the incident in 2005 when a group of eight pied tamarins were feeding in a ficus tree. They then observed a margay emitting calls similar to those made by tamarin babies. This attracted the attention of a tamarin “sentinel,” which climbed down from the tree to investigate the sounds coming from a tangle of vines called lianas. While the sentinel monkey started vocalizing to warn the rest of the group of the strange calls, the monkeys were clearly confounded by these familiar vocalizations, choosing to investigate rather than flee. Four other tamarins climbed down to assess the nature of the calls. At that moment, a margay emerged from the foliage walking down the trunk of a tree in a squirrel-like fashion, jumping down and then moving towards the monkeys. Realizing the ruse, the sentinel screamed an alarm and sent the other tamarins fleeing. A new paper by John Jaenike and his colleagues in Science, however, shows a form of biological evolution by natural selection that isn’t based on changes in genes. It’s based on changes in the presence of symbiotic bacteria that protect a species from parasites […] Some flies also carry another organism: the bacterial symbiont Spiroplasma, which is found in many insects. In D. neotestacea, however, the presence of Spiroplasma protects the fly from the sterilizing effects of nematodes. While flies with worms and no Spiroplasma are virtually sterile, the presence of the bacteria confers almost normal fertility on worm-ridden flies. It’s not yet clear how this works, but worms in flies with Spiroplasma are much smaller than those without the bacteria. Presumably the bacteria does something to the worms (or to the flies) that makes the worms grow much more slowly.